A genius idea has been hatched in Sweden. 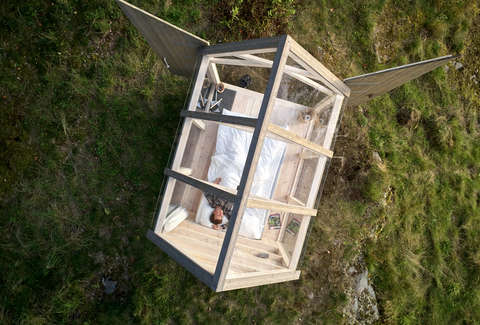 It's called the 72-Hour Cabin. In September, a slightly scientific experiment took place where five people with stressful occupations -- a German police officer and a French taxi driver among them -- spent three days on a private island in West Sweden just north of Gothenburg. 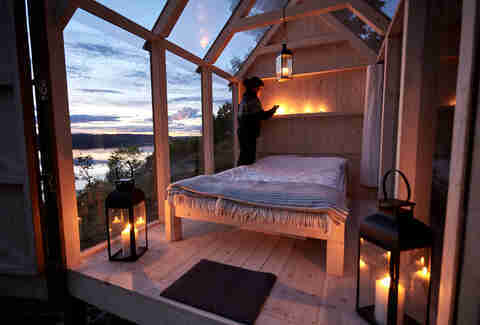 While there, they crashed in glass cabins with naught but some candles a warm, comfy bed. Sounds relaxing, right? That's the point. 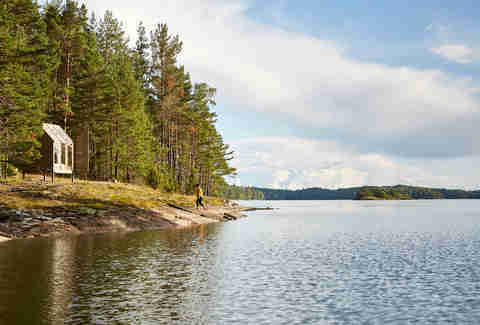 Getting "close to nature" -- a VisitSweden slogan -- and away from the stresses of everyday life is good for your soul and health. The test subjects self-reported their stress levels throughout their stay. As you undoubtedly assumed, they saw their stress drop dramatically. “The participants decreased their stress levels [by] almost 70 percent,” Walter Osika, stress researcher and associate professor at Karolinska Institutet, said. 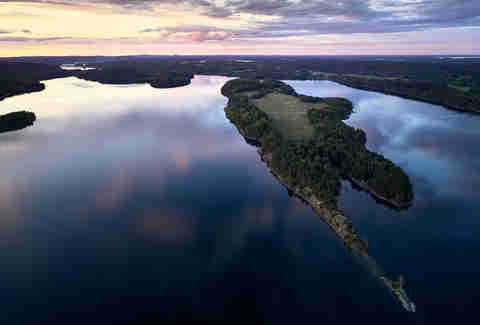 Now, you can stay on Henriksholm, an island in the middle of Lake Ånimmen that is half covered with forest and half with pasture. 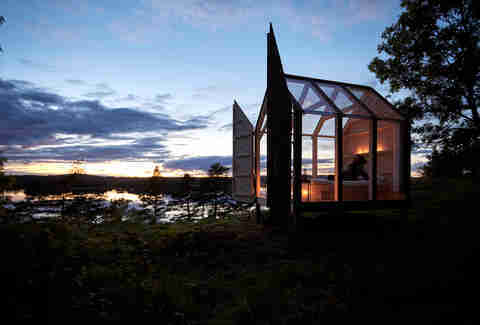 The glass cabins may be booked by any tooth-grinding citizen of the world. You won't be tracked like the test subjects, but the parameters of the stay are basically the same. You can stay a maximum of 72 hours after arriving simultaneous, kind of like contests on The Bachelor. While the scientific study doesn't sound all that scientific, it's hard to argue that spending time unplugged and in nature is going to make you more stressed out. 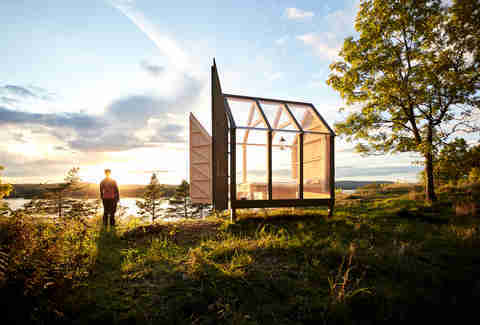 The glass cabins are the only structures on the island aside from a manor house and a smaller building called Palviljongen, which is where residents of the glass cabins can store possessions in private lockers, use the loo, or make a little food in the shared kitchen. On arrival, visitors are also handed a map of the island, flashlight, eye mask, water bottle, cup, roll of toilet paper, and a sleeping bag, in case you feel like the glass is getting in the way of you looking at the stars. 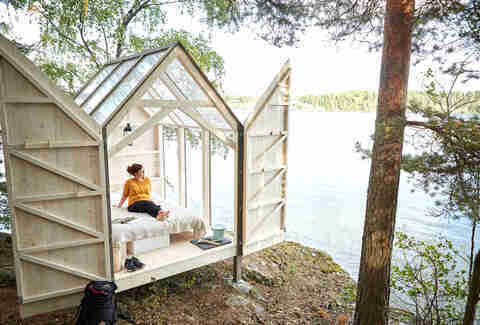 You also get access to rowboats, fishing rods, and a wood-burning sauna. The whole enterprise has a similar feel those glass igloos in Finland or the clear bubbles you can sleep in to watch the Northern Lights in Iceland. The one stress-inducing part of the trip may be the price tag. It's not cheap, but considering what you get, it's not a bad deal. For a single occupancy cabin, the total comes to about $815 per person. In a double occupancy, it's about $413 per person. The price includes the cabin and three family-style meals per day with the other guests. Maybe you can ease that stress with some of these cheap flights to Sweden available now from Norwegian. You can book a cabin here. There's limited availability, and it doesn't take reservations in the dead of winter because of, you know, the cold. The island is gorgeous, but there are still two other locations with 72-hour cabins. One sits on a hill overlooking Lake Iväg, and the other is at Baldernäs Herrgård manor house. Both come with access to a canoe and fishing rods. Additionally, they both have availability for spring 2018 at the moment.